A most common content of Buddhist works of art are excerpts or impressions of Buddhist literature. 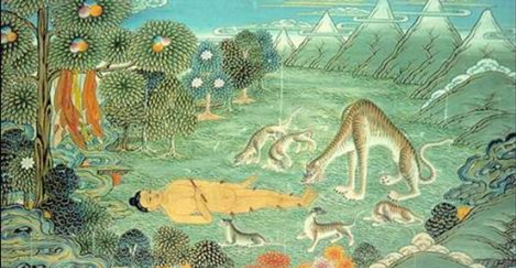 In early Buddhism, art mainly illustrated the Buddha’s life, the content of sutras and the Jataka tales. The scenes, personages and meanings of such art should be understood in view of the Buddhist literature in which they have their origins. Therefore, the first essential step for understanding a piece of Buddhist Art is identifying the source of the image. In early times the gestures (mudra), dresses and other details of the paintings and statues did not bear strictly prescribed symbolical meanings. Only later, with the development of Mahayana iconography, did a certain 5 mudras, known from older icons of the Buddha and referring to different scenes of his life, come to be associated with the aspects of the Buddha named Vairochana, Amoghasiddhi, Amitabha, Ratnasambhava and Akshobhya. These 5 Buddhas later began to also represent the five directions (East, North, West, South and Centre), the five colours, five skandhas, five kleshas, five wisdoms, etc. They also acquired certain objects as their distinctive symbols: Vairochana came to be associated with the Wheel of the Dharma, Amoghasiddhi with double vajra, Amitabha with the lotus, Ratnasambhava with a jewel, and Akshobhya with Vajra. In fact, most Buddhas, bodhisattvas and other deities came to be classified under one of these "Five Tathagatas" (sometimes called "Dhyani Buddhas" in Western literature), making the so-called ‘Buddha-families’ named after the above attributes (such as the Vajra-family), or after klesha, which is the central object to be destroyed through meditation within the family (for example, to destroy the dvesha). With the elaboration of a more complex Mahayana and Vajrayana iconography thousands of new images came into being. Their symbolism was designed (or interpreted) to represent different aspects of the Dharma. For instance, the two hands of a deity came to represent the 2 truths (relative and absolute); the three eyes of a deities’ face – the vision of the “three times” (past, present and future); the union of male and female figures – the inseparability of wisdom and method (i.e. compassion) throughout the whole spiritual path, and others. Likewise the six ornaments of a deity usually refer to the Six Paramitas, the 12 hands of Cakrasamvara symbolize the 12 links of Dependent Origination, the 18 legs of Vajrabhairava represent the 18 aspects of Emptiness and so on. "iconic" text, such as "sadhana." This is also the case for the meanings of many Vajrayana ritual implements, such as vajras, bells, drums. To learn what symbolism they convey in each particular case we must explore the corresponding text – the real source of this or that image. Still, the most general and widely employed symbolisms should be known, and many of these are now accessible to English-language readers thanks to Robert Beer in books such as The Handbook of Tibetan Buddhist Symbols (Serindia, 2003).